The int.TryParse method does the same thing as the int.Parse method, but without throwing an exception. Instead, it returns a boolean value indicating whether the method succeeded or not and writes the result to an out parameter. You might follow the same pattern when writing your own code, providing a method that throws an exception on failure and a TryXxx version of the method that returns a boolean indicating whether the method succeeded. Below is an example. When a corrupted state exception occurs as a result of executing some code within a try block, code within an associated finally block is not executed. This is true whether or not you use the HandleProcessCorruptedStateExceptions attribute to indicate that you want to catch corrupted state exceptions. In the example below, we execute some code that causes an access violation and a corrupted state exception occurs. We do catch the CSE, but the code within our finally block is never executed. Corrupted State Exceptions are exceptions that indicate that the memory state of the current process is likely corrupt. These CSEs by default cannot be caught by your code. This is normally what you want, since you typically don’t want to continue execution when one of these exceptions occurs. You can, however, set an attribute on a method indicating that you do want to catch Corrupted State Exceptions. If you set the HandleProcessCorruptedStateExceptions attribute on a method, it will then be able to catch this category of exceptions. In the example below, we are able to catch the access violation exception. Starting with .NET 4.0, there are a class of exceptions that will not be caught within a general catch block that catches all exceptions deriving from System.Exception. By default, a corrupted state exception will not be caught as a System.Exception. A corrupted state exception is a type of exception, like an access violation, that likely results in the internal state of the process being corrupt. In the example below, we artificially generate an access violation. Note that the exception that is raised is not caught, but treated as an unhandled exception. (Our catch block never executes). An exception being thrown from one assembly can be caught in a different assembly. This is true even when the assemblies are authored in different .NET languages. 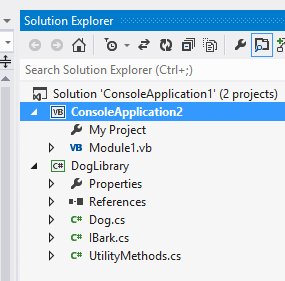 Below, code in the ConsoleApplication2 assembly, which is written in Visual Basic, calls code in the DogLibrary assembly (the Dog.Bark method), which is written in C#. 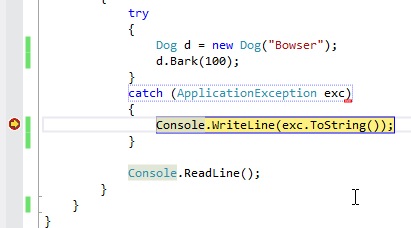 When an exception originates in DogLibrary, we can catch it in the code running in ConsoleApplication2. 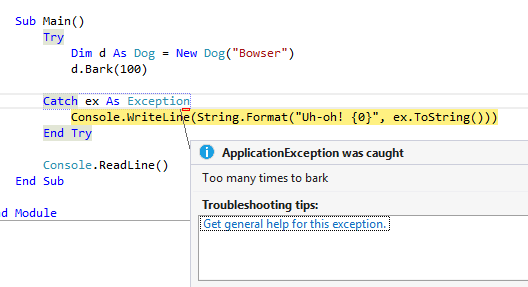 We can catch the exception in the VB code that was thrown by the C# code. If code within one assembly calls code within another assembly, exceptions originating within the code being called can bubble up to the calling code. The exception can be thrown from one assembly and caught in another. 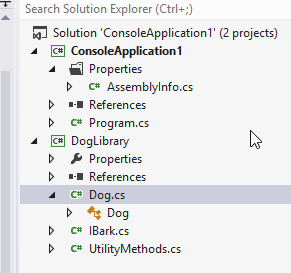 Below, code in the ConsoleApplication1 assembly calls code in the DogLibrary assembly (the Dog.Bark method). When an exception originates in DogLibrary, we can catch it in the code running in ConsoleApplication1.